UBC places sustainability at the heart of teaching, learning and research, operations and infrastructure, and community. Our strategic plans and policies guide us, while our annual reports and external benchmarks provide an opportunity to share success, measure progress, and highlight our ongoing commitments. 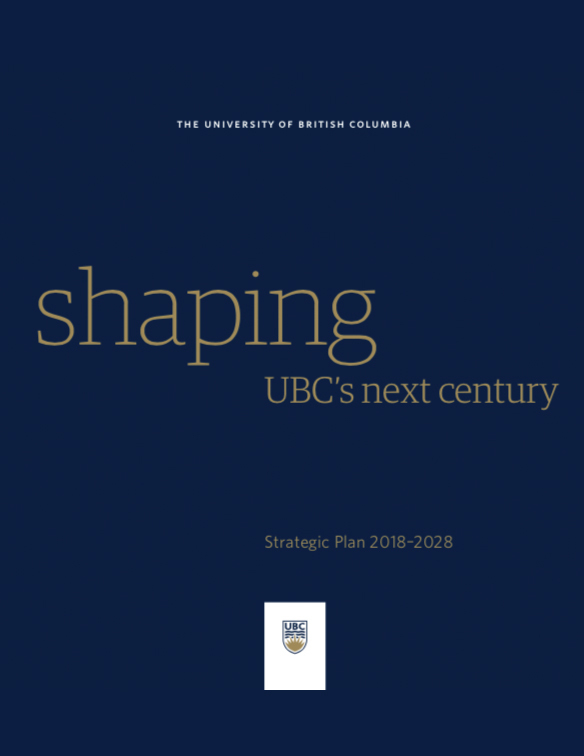 UBC’s strategic plan represents a roadmap. It sets out our collective vision, purpose, goals and strategies for the years ahead. It guides our decisions and actions - inspiring the very best in our students, faculty, staff, alumni and partners. And it challenges us to lead globally and locally in in sustainability and wellbeing across our campus and communities. 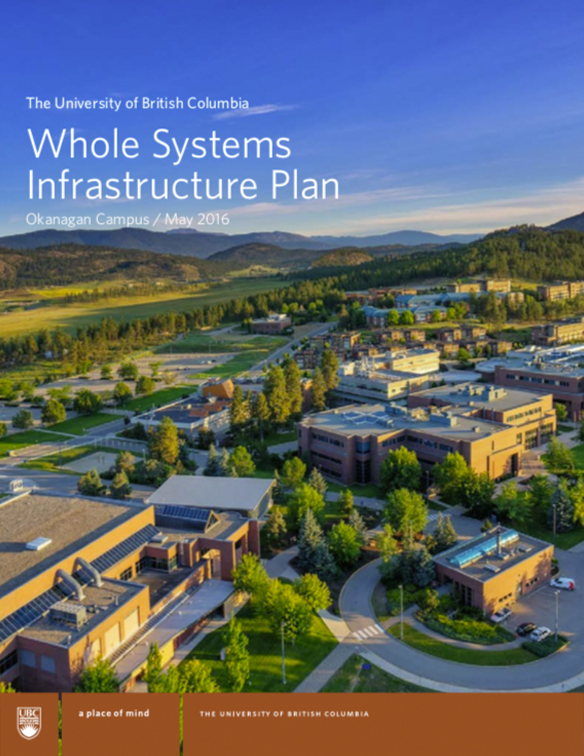 Visit UBC’s Strategic Plan website for more information. 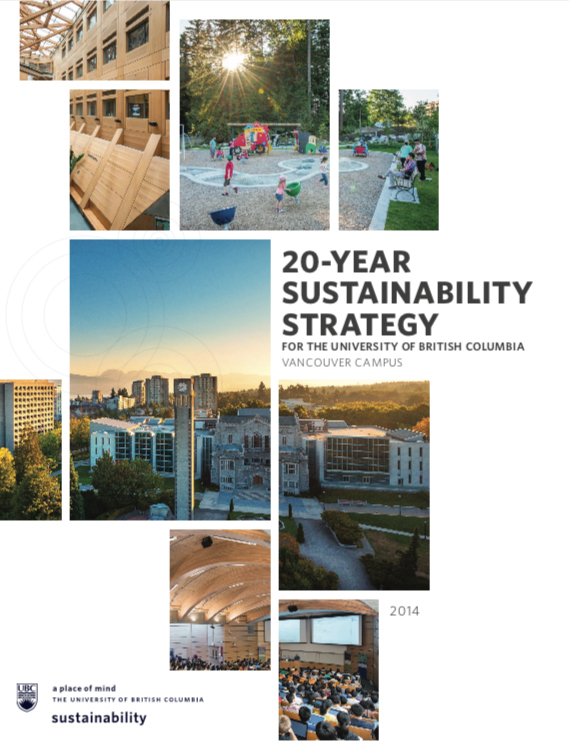 The 20-year Sustainability Strategy for UBC's Vancouver campus provides a long-term strategic direction for sustainability across teaching, learning and research, operations and infrastructure and the community. 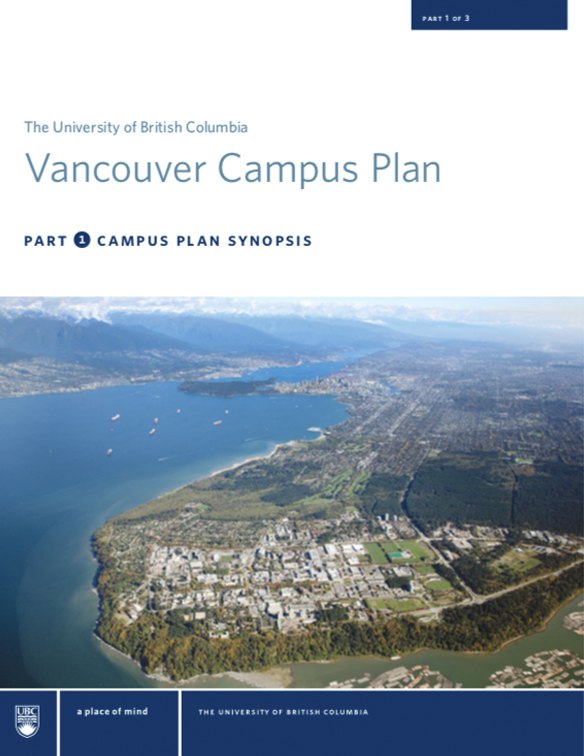 Updated in 2010, the Vancouver Campus Plan incorporates sustainability as the first of five interrelated strategies identified to achieve the plan's vision. Visit UBC’s Campus + Community Planning department website for more information. 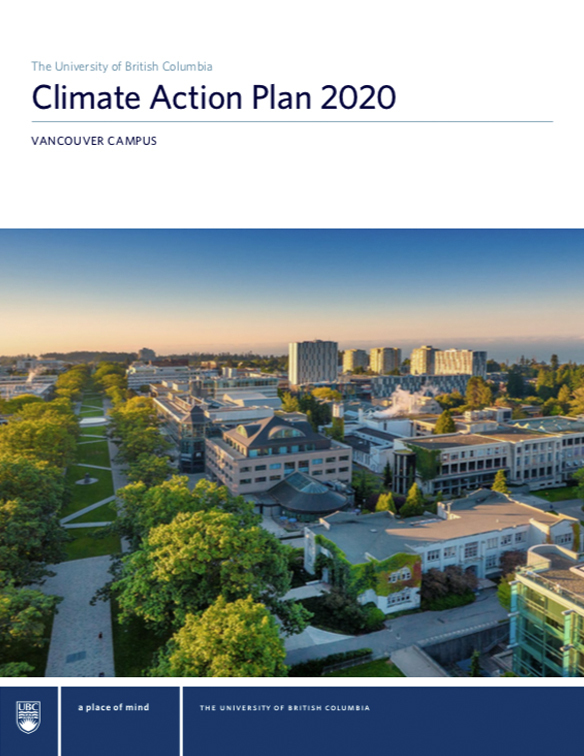 The UBC Climate Action Plan identifies UBC’s aggressive greenhouse gas emissions reduction targets and strategies, to guide the Vancouver campus in its ongoing transition toward a low carbon future. UBC, in collaboration with the University Neighbourhoods Association, has developed a comprehensive Zero Waste Action Plan. 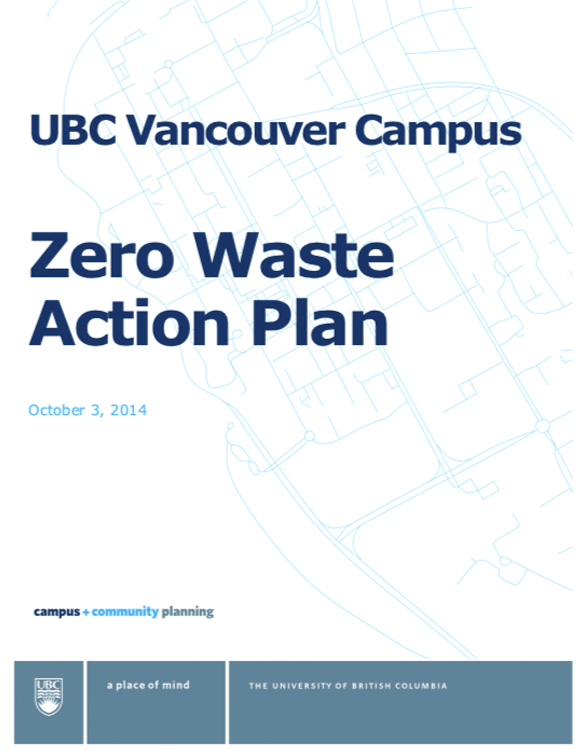 The plan outlines UBC’s targets to reach new milestones in waste reduction and management, and the actions required to meet those targets. 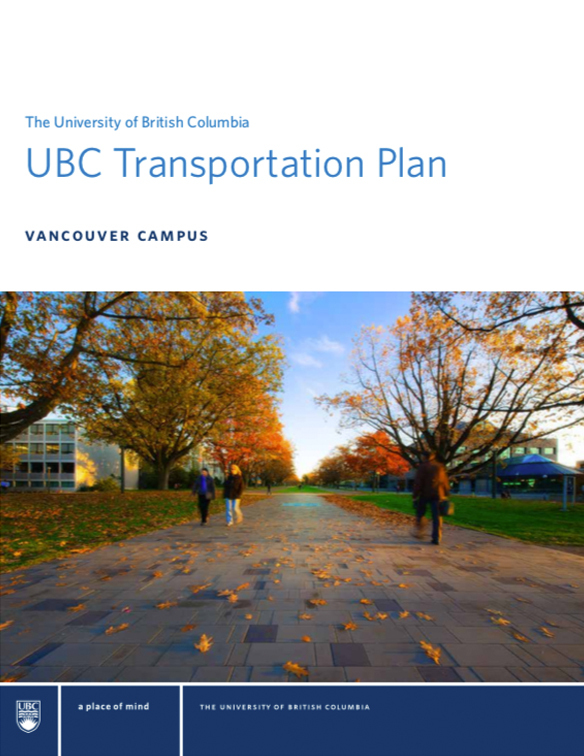 UBC's Transportation Plan provides guidelines and recommendations for managing changes to UBC’s transportation systems, proposes solutions to many campus transportation issues, and includes strategies for implementing important changes in how we travel to, from and around campus. 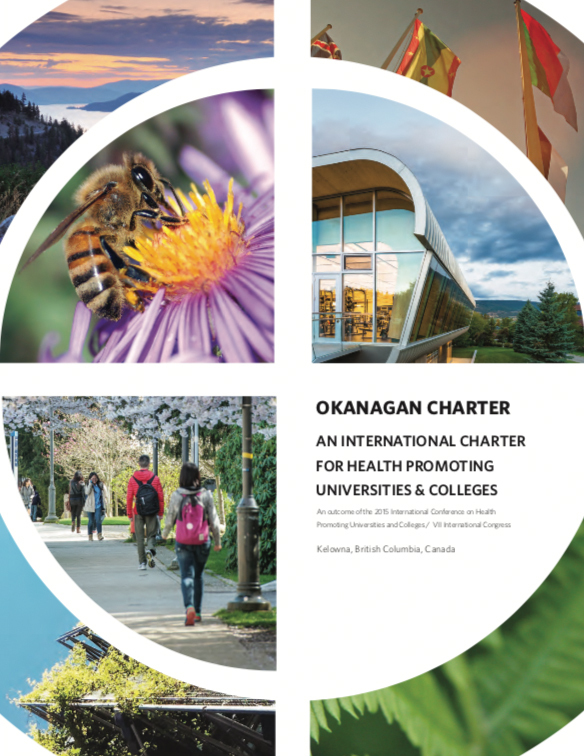 UBC Wellbeing is guided by the Okanagan Charter, a shared call to action for partners, leaders, and community members to make UBC a leading wellbeing-promoting university. Visit the UBC Wellbeing website for more information. 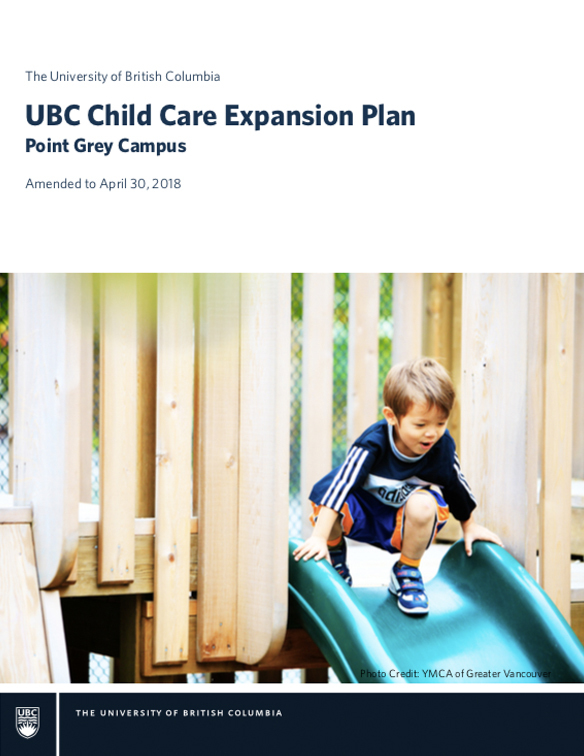 Created through a collaborative process to inform the UBC strategic planning process, this document provided recommendations around specific academic themes to guide the work of the UBC Sustainability Initiative. UBC's first sustainability strategy, produced in consultation with over 20 UBC departments, all 12 faculties and all major student organization at UBC Vancouver. 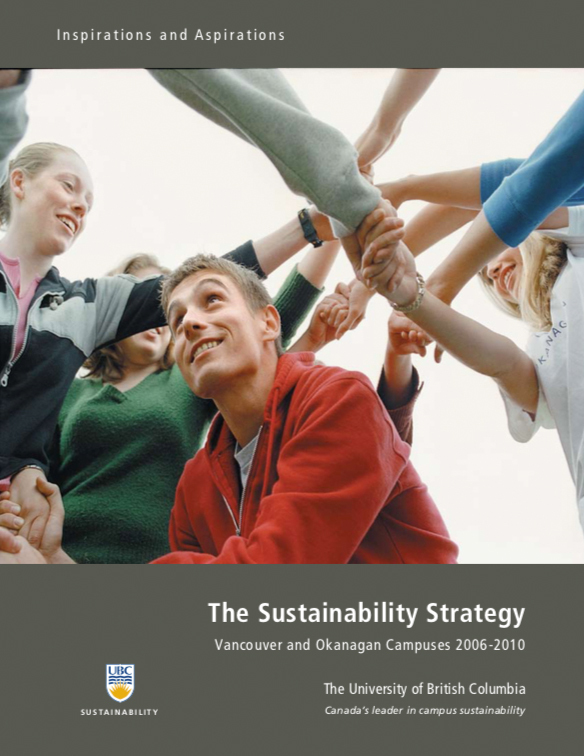 The strategy provided a framework and identified major the first goals, objectives and targets for sustainability at UBC. 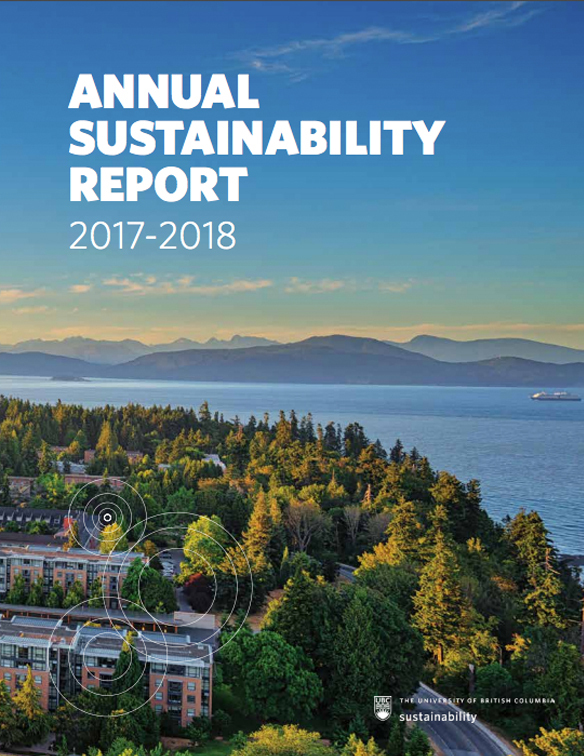 Our Annual Sustainability Reports provide an overview of sustainability activities and highlight achievements at UBC's Vancouver and Okanagan campuses. Carbon Neutral Action Reports are required under the province's carbon neutral regulation. The reports track UBC's actions and progress towards carbon neutrality, and our achievements toward the goals of UBC's Climate Action Plan. Inventories for our Vancouver campus emissions have been completed each year since 2006. Transportation Status Reports provide a comprehensive review of UBC transportation patterns and trends over time. UBC’s leadership in sustainability is consistently recognized with top marks in third-party rating systems. In 2015, UBC achieved our second consecutive Gold rating in STARS, an internationally recognized campus sustainability benchmarking framework. STARS is a voluntary, self-reporting framework which allows us to report our sustainability focused activities and performance against a set of common measurements. Credit for sustainability may be earned in five categories: Academics; Engagement; Operations; Planning & Administration; and Innovation. In 2011, UBC was Canada's first university to achieve a Gold STARS rating. In 2015, we obtained our second consecutive Gold STARTS rating. UBC’s STARS rating is valid for three years. In 2012, UBC was the first Canadian institution to sign the ISCN-GULF Sustainable Campus Charter. The ISCN provides a global forum to support leading colleges, universities, and corporate campuses in the exchange of information, ideas, and best practices for achieving sustainable campus operations and integrating sustainability in research and teaching. As part of our signatory requirements, UBC submits annual reports to the ISCN on our sustainability achievements and performance. 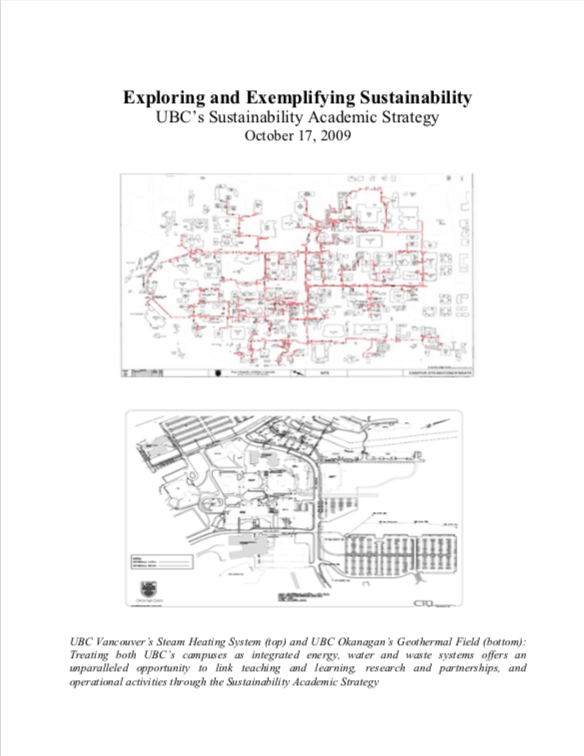 In 1997, UBC became Canada's first university to adopt a Sustainability Policy (Policy #5), and a year later, became Canada's first university to establish a Campus Sustainability Office. Our sustainability policies span sustainable development, energy, grounds, waste and more and provide the basis for sustainable practices on campus. For a full list of UBC policies, please refer to the Office of the University Counsel website.